Need reasons to see us first? 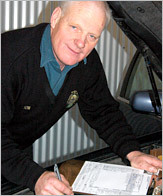 One of the key factors separating the Dunedin Warrant of Fitness Centre from other drive through testing facilities is the Company policy of fixing minor repairs such as replacing wiper rubbers, light bulbs and other small jobs on the spot with no added labour charge to avoid the need to return for a re-check. Copyright © Dunedin Warrant of Fitness Centre Ltd 2009, All rights reserved.